I seldom cook ever since my finger injury last month. Right now I have no extra hand coz Hubby has left to work in the US. It was a total fun when he was around, helping out and cooked for us. He's just so funny in the kitchen coz he'll be always doing some acts to make me laugh. And we talked alot while cooking (okey, it's me who talked more)! Back to the chicken dish today. I need to cook something quick and easy, so that I don't have to use my finger much, remember it's still wired! Another week left for removal. Come, let's peek at the recipe! Mix ingredients (A) and set aside for 10 minutes. In a bowl, mix ingredients (B) for sauce. Deep fry chicken pieces in oil until cooked, drain on paper towel. Reduce oil, saute garlic and ginger until fragrant. Add dried chilli paste and stir. Add onions, chillies and the prepared sauce. Stir and add chicken broth. Allow to boil a few times and add fried chicken pieces and a little salt if needed. Transfer to a serving plate. Squeeze some lemon juice over. Serve with plain hot rice! 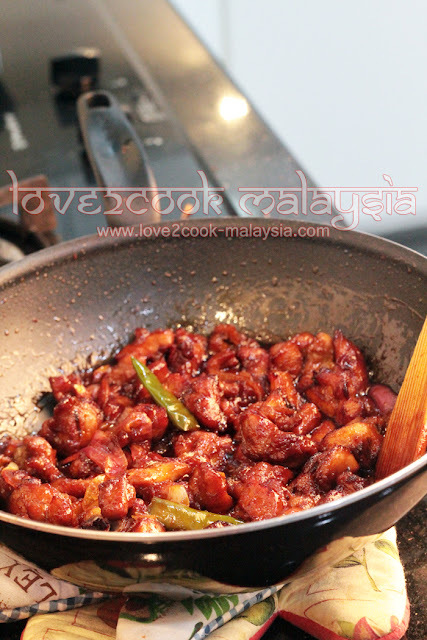 Add more dried chilli paste to give that fiery red dish! 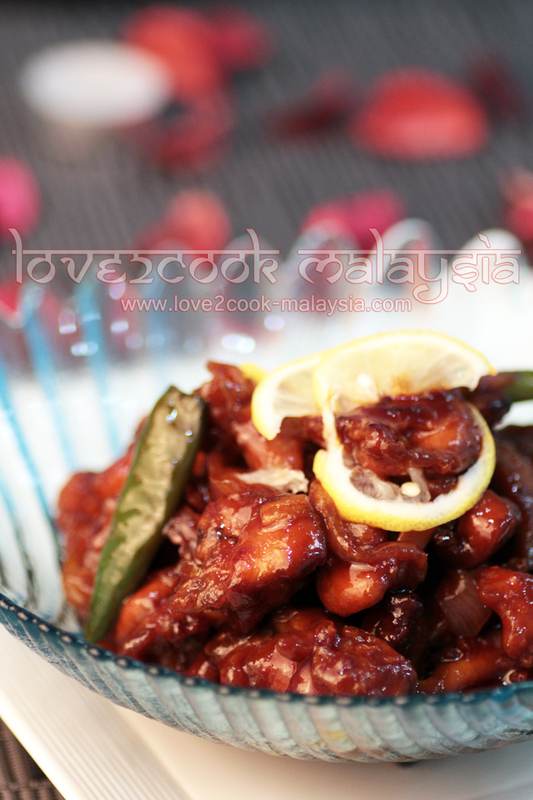 sweet and sour chicken looks so tempting...! yummy yum..! Must try. Thank You for new variations. Be gentle with your finger. 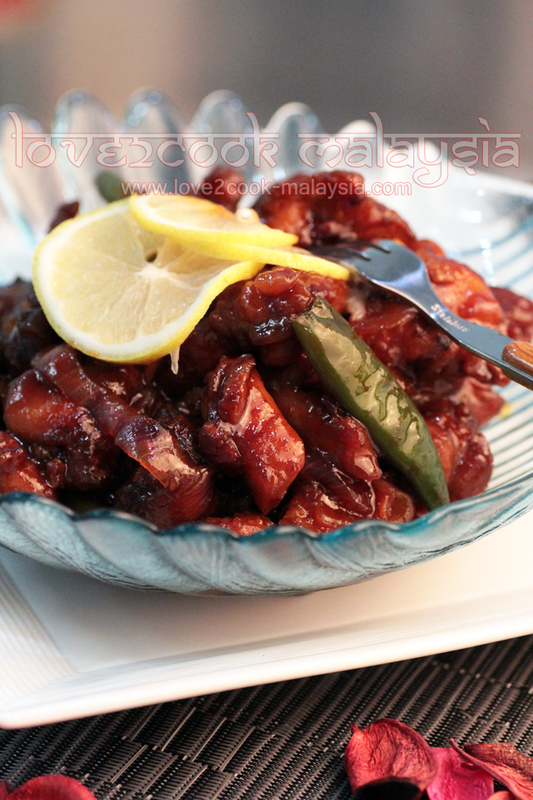 tun suka sgt sweet n sour chicken. mesti susah kn masak dgn jari yg blm sembuh..
nway, the chicken looks soo yummy! wowww..yummy..look0 so delicious.. u make my mouth wet.. hahaha..
elin dh buat td. mmg sedap!!!! tp kenapa warna nya x merah mcm kamu eh..:) ada kurang kot. elin dah link menu pd page kamu. Chicken looks simply tempting and lavish. You truly are a Master Chef. Hi love....look delish la.. and i like your photoshoot very elegant and nice. Mind asking you what type on lens you are using for this photo. k.ct akan cuba buat resipi ni nanti, memandangkan anak2 mengemari lauk ayam berbanding ikan, thanks Love, k.ct amik resipi dulu. Nampak sangat menyelerakan. 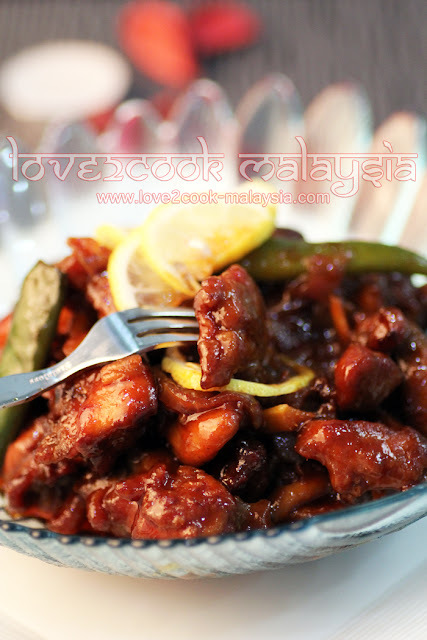 mouth watering chicken, looks truly restaurant style!! Hello Friend! How you been??? 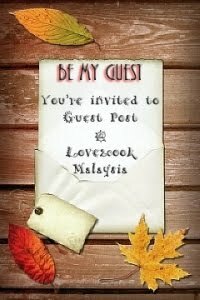 Mintak tisu sikit.. Ai nak lap air liur yg meleleh tgk lauk ayam you ni..heheheh So tempting!! Hello :-), I'm going to try this recipe tomorrow. If you don't mind, can I share your blog add with my friends too? Thank you Love. Hi Loveeee..apa kabar?lama k.atie xsinggah kat sini.Blog pon dah tambah cantik....masakan pon lg best2!! Hi love....thanks for your info about lens. Anyway i love your chicken too ...expecially when cooked like this. Really enjoyed eating with a piece of bread or tortilla will do. ahhhh . sedapnya tgk ayam tu ... kalau akak mmg suka sgt makan menu mcm nie... nak kena buat nnt nie... mmg nampak enak tu..
What a special chicken dish to try hands on with. Iam feeling hungry now :) Its straight onto my face, who can resist it? Definitely not me. Thanks for the wonderful recipe.. I tried it and my family loved it. Mine wasnt as red as yours and I made it with slightly more gravy than yours.. Thanks..